This implies that the protection of property or preventing a non-violent crime may allow a law enforcement official to use a firearm. This does not comply with international law. Section 7 of the Constitution stipulates that: "No person shall be subjected to torture or to inhuman or degrading punishment or other treatment." During a period of public emergency, however, the Governor-General of Belize mayS. 18(9), 2000 Constitution. In Belize, legislation does not specifically regulate the police use of force. Instead, the actions of the police are governed by the 2011 Criminal Code as a statutory authority authorised to use force. The Criminal Code provides that in order for force to be legitimate, it must be justifiable, and that this will occur when force is used in pursuance of a matter of statutory justification.S. 30(1) Criminal Code.Article 31 of the Code sets out the grounds on which force may be justified, which include authority to arrest and detain for a felony crime; authority to arrest, search or detain a person otherwise than for a felony; necessity for prevention of or defence against crime; and necessity for defence of property or possession, or for overcoming obstruction to the exercise of lawful rights.S. 31 (d), (e), (f), and (g). 2011 Criminal Code.Section 32 states that force cannot be justified as having been pursued in pursuance of a matter of justification which is in excess of the limits prescribed, or which extends beyond the amount and kind of force reasonably necessary for the purpose for which force is permitted to be used.S. 32, 2011 Criminal Code. The Belize Police Department standing orders, that reportedly set out in more detail when and how a police officer may use force, are not publicly available. They are, though, reviewed in the 2008 Crooks Report, which was conducted by a retired Jamaican Police Superintendent. The report states:2008 Crooks Report, p. 84. The BPD standing orders to members governing the use of force takes a most unhelpful approach to the often complex situations in which police officers sometimes find themselves, especially regarding the use of lethal force. Among its many flaws is the absence of emphasis on the principle of proportionality. 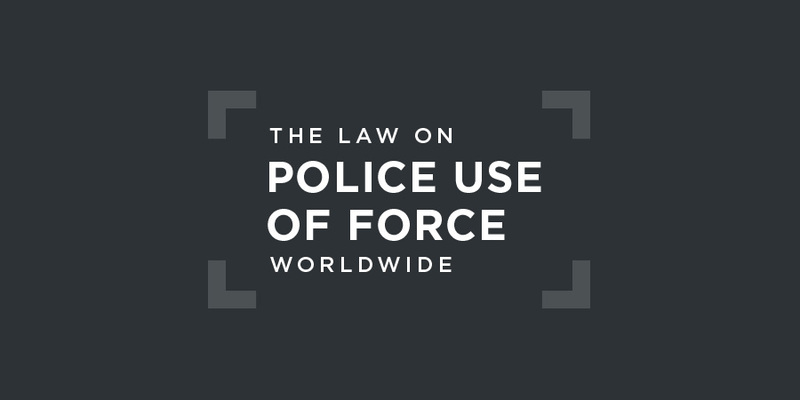 The Crooks Report, recommended that a new use of force policy be elaborated, including the basic principles in relation to the selection, testing, acquisition, and use of firearms and less-lethal weapons by the police.2008 Crooks Report, p. 165.It is not known if this was done. Under the 2000 Firearms Act: a police officer may discharge a firearm within 40 yards of any public road or public place if he or she has the permission of the Commissioner of Police or has "any other lawful excuse or justification".S. 40, 2000 Firearms Act. the jurisdiction to hear and determine any application, and make such declarations and orders, issue such writs and give such directions as it may consider appropriate for the purpose of enforcing or securing the enforcement of any of the provisions of sections 3 to 19 inclusive of this Constitution. Therefore, according to the constitutional provisions, if a police officer were to use force in circumstances and in a manner which was not justifiable, the victim would be entitled to seek redress through the Supreme Court. shall be deemed to have committed an offence against discipline and may on conviction thereof by the Commissioner, or, in his absence, by an officer of the Department deputed by him, be punished for such offence. According to the 2011 Criminal Code, however, “For the purposes of this Code, force or harm is justifiable and shall constitute a defence to any criminal charge when such force or harm is used or caused in pursuance of such matter of justification, and within such limits as hereinafter in this Title mentioned.”S. 30(1), 2011 Criminal Code. Use of force in custodial setting is governed, in general terms, by the 2000 Prisons Act, which provides that: “It shall be lawful for all prison officers to use such force as may be actually necessary for the carrying out of any method of identification authorised....”S. 33, 2000 Prisons Act. According to Article 287 of the Criminal Code, which governs "Oppression by gaolers", every prison officer who inflicts torture on a prisoner, who is guilty of cruelty to a prisoner, or who intentionally and unlawfully causes any harm to a prison, shall be liable to imprisonment for 2 years.S. 287, 2011 Criminal Code. There is no formal civilian police oversight body in Belize. An internal police investigative division exists as does a national ombudsman to whom complaints may be directed. In 2013, the Human Rights Committee issued concluding observations in the absence of a report of Belize's implementation of the ICCPR. The Committee expressed its "at reports that excessive use of force by law enforcement officers is widespread" in Belize. It called on Belize to "take concrete steps to prevent the excessive use of force by law enforcement officers by ensuring that they comply with the 1990 United Nations’ Basic Principles on the Use of Force and Firearms by Law Enforcement Officials".Human Rights Committee, Concluding Observations in the absence of a report, UN doc. CCPR/C/BLZ/CO/1, 26 April 2013, §19. Belize is not a state party to the 1969 American Convention on Human Rights and has not accepted the jurisdiction of the Inter-American Court of Human Rights. The Inter-American Commission of Human Rights has made recommendations to Belize on human rights issues on the basis of Belize's membership of the OAS. The Edwin Ixpatac case, which concerns the alleged murder of a citizen by police officers, is due to be decided by the Supreme Court imminently. In 2016, it was alleged that government agents committed an arbitrary or unlawful killing. Three police officers in San Pedro Town were initially charged with murder after they were accused of beating 30-year-old Edwin Ixpatac to death in March. According to the police report, two police officers responded to reports that Ixpatac had been drinking at a bar and was acting in a disorderly manner, and they found him injured. Police did not seek medical attention for him and detained him until the following morning, when authorities realized he was unconscious in his cell. Video footage showed he was abused by three officers, and the post-mortem revealed that he died from a blow to the head, which investigators claimed he received during his detention. The Belize Police Department (BPD) admitted administrative neglect on the part of the officer in command but stated police authorities would deal with it internally. In October 2016, the Director of Public Prosecution downgraded the charges against the three officers from murder to manslaughter, and the men were released on bail awaiting trial. were detained in the police station does not, in my view, make their detention lawful, for otherwise, that would confer a charter on the police to detain unlawfully anyone. It is not the place of detention that makes it lawful or unlawful – it is the cause or reason or lack of reason, and the manner of the detention that makes it unlawful. By law, imprisonment or detention can amount to assault. It is not in doubt that it is within the general scope of the duty of police officers to prevent crime and bring offenders to justice. But it should equally not be in doubt that it is most certainly outwith that duty of police officers to inflict wounds on persons already in their custody.